HELP THIS THIRD GRADE CHILD FIGHT CANCER. Ajay is currently battling NHL type cancer. He is a third grade student studying in a government primary school. He comes from a village named Rajapalayam , situated about 7kms from tiruvannamalai. HE is currently undergoing treatment in Egmore child hospital. His mother is a person supporting him. she needs to stay in chennai throughout the treatment and has nonone to provide food or accomodation. She is in desperate search of funding to help her son. I again would like to thank all the donors for contributing towards Ajay's food and other expenses. 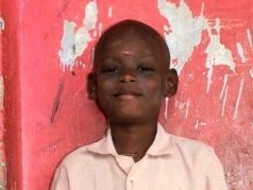 Ajay is currently being treated at chennai, Egmore child hospital. He had been started with his next round of chemotherapy, but was unable to continue it because of his increased level of Hepatitis and low immunity. Doctors have advised a strict diet plan for him which includes a lot of vegetables, fruits and some nutritional supplements. In addition to this the child is suffering a lot due to an infection in Esophagus due to which he is unable to eat or drink much. He is suffering a lot from multiple side effects of chemo and other steroids given to him for the treatment purpose. So the need of the hour is that the child should be provided with the required medicines and good nutrition. Ajay will be under treatment tentatively for the next one year for all his rounds of chemo to be completed. His mom is the person who takes him to treatment. She stays along with the child throughout the course of chemo. Her husband who is a alcoholic addict does not support her financially or morally. So all the expenses are to be borne by her. As for now she is unable to go for any kind of job as she needs to be with Ajay for his treatment purpose. As for now she has no financial support to provide the basic needs to her child and herself. Egmore hospital has no facilities to do biopsy tests and other related tests. So every time a test is needed to be done for Ajay it has to be taken in some private hospitals. She needs money for all this. So I am transferring all the amount donated towards the child to his mom's account so that it will be helpful for her to provide a good diet for her child and also bear the day today expenses while she is staying in chennai for his treatment. The money will also be used to buy medicines which are not provided by the hospital. The money will also be used in future for any tests that have to be done for Ajay in any private hospitals. Thank you all once again for your generous contribution. Your contributions are helping a child fight his cancer bravely! A big Thank you for all the donors who contributed towards Ajay's treatment. I am awe struck at how much good souls I know. Just a day after putting up the post , it was shared by many people and an amount of nearly 70,000 has been collected thru Milaap. Some good souls have contributed directly to my account. So this is a small update about his treatment now. Ajay is in chennai egmore hospital at present. He has been tested for jaundice and other criteria for his next round of chemo. Actually we had a plan of taking himto adayar. But as his next round of chemo was already delayed due to financial problems I did not want to delay the treatment. So only after he completes this round of chemo I will be able to take him to Dr.Shantha for further reference. As for now, I have given 10,000 to his mom for daily expenses as both the child and his mom have to feed themselves all three meals a day . moreover, the doctor has suggested some meds and nutrition powders for him which are expensive. I have asked her to spend on the meds and nutrition powders liberally. I have asked her to keep a record of all the expenses. As for now this is the update. I will get hold of xerox copies of his treatment details by Wednesday. Will update then. Anyone in chennai. Willing to visit Ajay in egmore please ping me. He will be happy to have visitors!